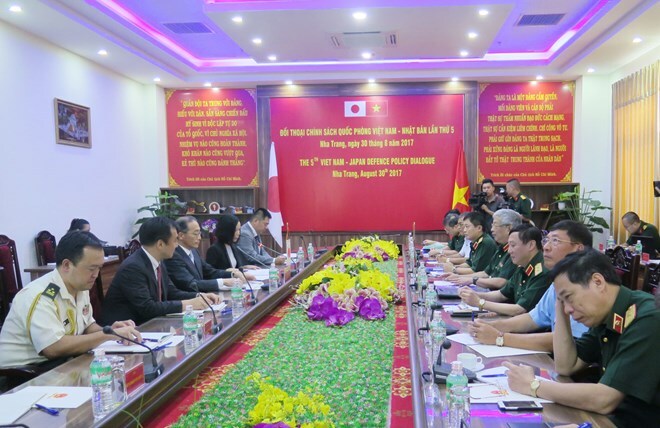 Khanh Hoa (VNA) – The 5th Vietnam-Japan defence policy dialogue took place in the south central province of Khanh Hoa’s Nha Trang city on August 30 under the co-chair of Deputy Defence Minister Sen. Lieut. Gen. Nguyen Chi Vinh and his Japanese counterpart Manabe Ro. At the dialogue, the two sides discussed world and regional issues of mutual concern and reviewed the outcomes of implementing cooperation contents reached at the previous event in Tokyo in November 2016. Both sides expressed their pleasure at progress in defence cooperation in the recent time as well as the activeness of Vietnamese and Japanese relevant agencies in deploying the agreed contents. In the coming time, the two sides agreed to continue strengthening partnership in various fields such as exchange of delegations at all levels, personnel training and sharing experience in UN peacekeeping activities and overcoming war aftermaths, including bomb and mine clearance and dioxin detoxification. They also agreed to work closely in cyber security, maritime security, defence industry and technology transfer. In addition, the officers also consented to create favourable conditions for defence units to conduct cooperation activities in the spheres of rescue, military medicine and exchange of information among strategic research agencies of the two defence ministries. Vinh stressed that the Party, State and People’s Army of Vietnam have paid great attention to dealing with the war consequences and are calling for support from the international community. Vietnam expected that Japan will provide official development assistance (ODA) to help the country test new dioxin detoxification technologies in Bien Hoa airport in the southern province of Dong Nai and carry out bomb and mine clearance projects, he said.